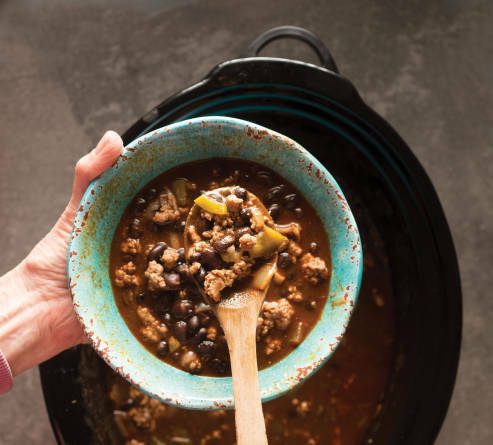 Above: Before or after the big feast, serve up a robust chili made the easy way. Photography by Douglas Merriam. ANYONE WHO HAS EVER TRIED TO simultaneously deliver a 15-pound bird, gravy, dressing, and all the trimmings to the holiday table knows that Thanksgiving can be stressful on the cook. It used to make me want to guzzle the bourbon I was planning to stir into the pecan pie filling. I can relax, though, when I know I have options. It turns out that the slow cooker can be just the tool to help any of us zip through the holiday. If yours is stashed in the back of the pantry, it’s time to move it front and center. Here in the Southwest, the slow cooker is perhaps best known as the warming device of choice for beloved chile con queso. In general, though, most learned hands turn to it for its value in preparing all-day-cooked soups and stews. It can be recruited for making vegetable dishes, such as the sweet potato gratin included here, or for baked goods, like the featured cornbread. It excels at dessert, too, at least for recipes that use moist heat. That makes it truly perfect for a quivering, vanilla-and-almond-scented flan. The four recipes here come from my latest book, Texas Slow Cooker (Harvard Common Press). They can all just as easily put down roots on a New Mexico table, at Thanksgiving and beyond. You might make the sweet potato gratin or the cornbread as part of the big Turkey Day meal, since it would mean one less dish for your overworked oven or stovetop. Whip up the chili on Thanksgiving eve for an easy visitors’ supper ahead of the holiday, or make it and the cornbread for snacking through the weekend’s football-parades-and-Netflix marathon. At my home, pecan and pumpkin pies always disappear before nightfall on Thanksgiving, so the flan could be a different style of dessert to go with the day-after spread of turkey soup or my favorite, turkey-dressing-and-cranberry sandwiches. However you choose to mix and match, slow is the way to go. We are talking chili with an i here. If you like, you can substitute leftover turkey. Generously rub the inside of the slow cooker with 1 teaspoon oil. Warm remaining oil in a large, heavy skillet over medium heat. Stir in onion and sauté until limp, about 3 minutes. Mix in bell pepper and garlic and sauté until tender, 5–8 minutes. Add the turkey and sauté it just until it loses its raw color. Scrape the mixture into the slow cooker. Add the chili powder, chipotle chile, cumin, salt, and bay leaf. Add the beans and tomato sauce. Stir together. Pour in just enough broth to cover the beans and meat. Cover and cook on low for 5–6 hours. Serve the chili immediately, or cool, refrigerate overnight, and reheat. Serve hot in bowls, with sour cream, if you wish. You can serve this with butter, but when time permits, I like a touch of sorghum butter, made with a molasses-like syrup that comes from a traditional Southern grain crop. You can use molasses if you prefer. Generously butter the inside of the slow cooker. Pour inch of water into it. Arrange a 3-inch biscuit cutter in the middle of the cooker, if you have it. Otherwise, roll up an 18-inch piece of aluminum foil from one of its long sides into a snake, then bend it into a coil to fit in the bottom of the cooker as a rack. The water should be below the top of the rack. Butter the inside of a quart soufflé dish or deep 6-inch cake pan. In a small bowl, stir together cornmeal, flour, baking powder, and salt. With a whisk or an electric mixer, blend the butter and brown sugar in another, larger bowl until mixture is creamy and sugar is mostly dissolved. Add eggs, one at a time, then buttermilk, corn kernels, jalapeños, and cheese. Add dry ingredients to wet ingredients, beating just a few strokes until incorporated. Pour batter into the prepared dish and transfer it to the slow cooker. Cover and cook on low for 2–3 hours, until a toothpick or cake tester inserted in the center comes out clean. If cornbread seems underdone after 3 hours, take off the lid and cook for another 5–10 minutes, then check again. While the cornbread cooks, make sorghum butter. Whip it—or at least whisk it well—in a small bowl until thoroughly combined. Reserve at room temperature. When cornbread is done, set the pan on a baking rack to cool. When cool, cut it into wedges or squares in the size you wish. Serve with sorghum butter. Flan makes the quintessential flourish after either a Tex-Mex or a New Mex meal. This version supplements the silkiness of the flan with fragrant undertones of almond and vanilla. Scatter sugar in a 2-inch-deep 6-inch cake pan. Place the pan over a stove burner and turn heat to medium. Caramelize sugar in pan, using oven mitts to shake the pan as needed to turn sugar a rich medium brown. Set aside to cool. Pour inch of water into a slow cooker. To hold the baking pan above the water, place a biscuit cutter or foil snake in the center of the slow cooker (see cornbread recipe). The water should be below the level of the rack. With an electric mixer, beat together remaining ingredients until combined. Pour custard mixture into the cooled pan of caramel. Transfer pan to the slow cooker. Cover and cook on high for 2–2 hours. Let flan cool an additional hour in the slow cooker, then remove the pan, cover it, and refrigerate for at least 4 hours and up to overnight. To unmold the chilled flan, run a knife between its edge and the pan. Invert onto a plate and serve. Slow cooking tends to tone down any spice flavors, so you need to season more assertively; for example, I usually double the amount of fresh garlic. Fill a slow cooker only about three-fourths of the way to the top; ingredients can expand when hot. Fill it less and it will cook somewhat faster than the time quoted in a recipe. Use about 50 percent less liquid when braising a roast, because evaporation is minimal. High altitude doesn’t seem to affect slow cooking times too much, except for dried beans. Pintos and their cousins may indeed take several more hours than recipes suggest, and they may need more liquid added to avoid drying out. Today’s cookers have come light-years from the one-piece burnt-orange Crock-Pot of my college days. Slow cookers are now more common than coffee makers in American kitchens, perhaps because you can buy a basic round 4- to 5-quart slow cooker and get back change from a $20 bill. I own two Crock-Pots—one of those basic models and a 6-quart oval-shaped one. The pricier version, at about three times the cost of the bare-bones model, comes with features like a digital timer and a warming setting. My third go-to cooker is a sleek 6-quart All-Clad, an investment of more than $200. It has an unbreakable metal cooking insert, rather than the more common ceramic. Other companies make models at all price points in between. You can get one with an outside “wrap” that displays your loyalty to an NFL or college team. Some include a searing plate, which lets food initially brown right in the slow cooker so you don’t have to transfer it from a skillet. You can even find one that takes Wi-Fi instructions from your cell phone. And now we have contraptions like the Instant Pot that can do the job of a slow cooker, rice cooker, steamer, and pressure cooker. Because I have a small kitchen, I like models with a hinged lid, which solves the riddle of where to set the lid when serving from the cooker.